Lenten season is finally upon us. 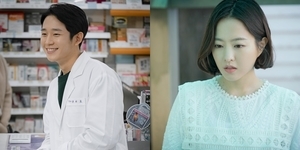 For the food lovers, this time of the year means more than just doing their penance – it is also that time of the year where certain food adjustments must be made to keep to traditions. The good news is that you don’t really need to eat BAD just to stay faithful to the season’s food restrictions. Here, we list all the best meals you can try, from fast food favorites to the higher-priced splurges. 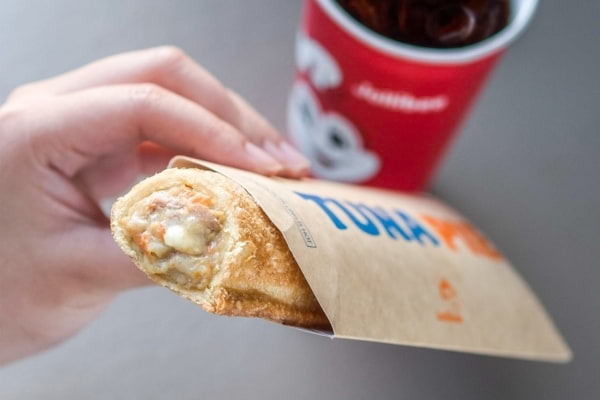 Food lovers out there know that Lenten season is finally around the corner once local fast food Jollibee brings back its infamous Tuna Pie. Though it’s not really a “meal”, this special offering is always something that Pinoys look forward to thanks to its flaky, golden crust and savory peppery tuna filling. With its ultra-affordable price, you can turn this into a full meal by buying a few boxes of it and some pineapple juice to wash it down! 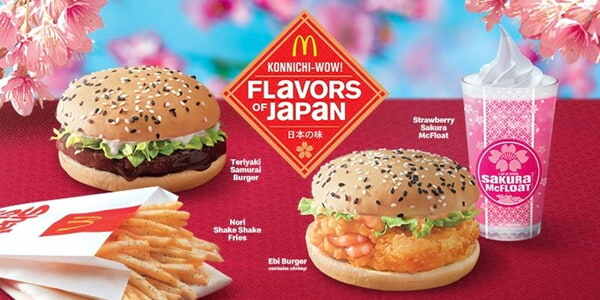 Fast food giant McDonald’s recently released their Flavors of Japan special menu which – though not really a Lenten special – includes the Ebi burger, a savory masterpiece that includes a tempura-coated shrimp patty, lettuce, and Thousand Island dressing sandwiched between buns lightly peppered with sesame seeds. Those who love Oriental flavors will surely enjoy the melody between the well-seasoned shrimp patty and the sweet dressing that balances out its saltiness. Go and order the Ebi burger with the Sakura menu to upgrade it with the special edition Nori Fries and Strawberry Sakura McFloat. Wanting to stick to your Lenten commitment but can’t really give up rice? 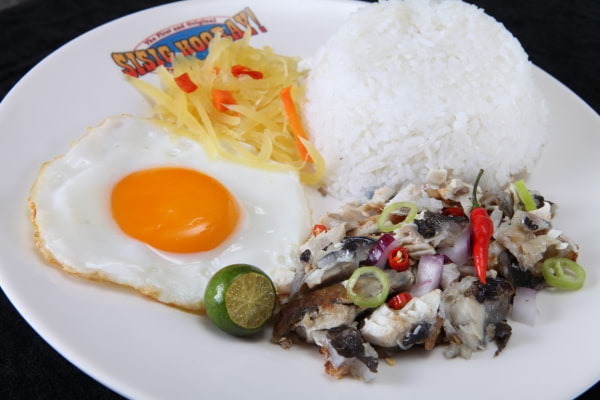 Sisig Hooray’s budget Bangus Kasilog meal just might be your saving grace! Though more known for its pocket-friendly pork sisig meals, this food court regular also serves a pretty mean bangus sisig meal – a recipe of lightly seasoned boneless milkfish with chili, onions, and a secret special sauce. Don’t forget to drizzle this dish with calamansi before mixing well and pair it with their tangy atchara for that perfect blend of flavors. 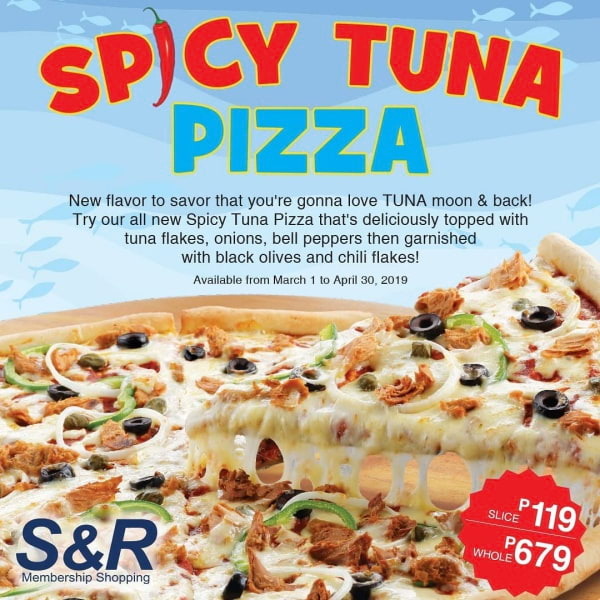 Whoever said that you can’t enjoy a mean slice of pizza during the season of penance probably hasn’t tasted S&R’s newest spicy tuna pizza. This flavor is the perfect Lenten-inspired cheat meal with toppings of onions, bell peppers, olives, tuna, and chili flakes scattered over a bed of melted cheese. One slice is already big enough to fill you up well, but if you find yourself wanting more, you can order S&R’s equally good clam chowder as a side dish. 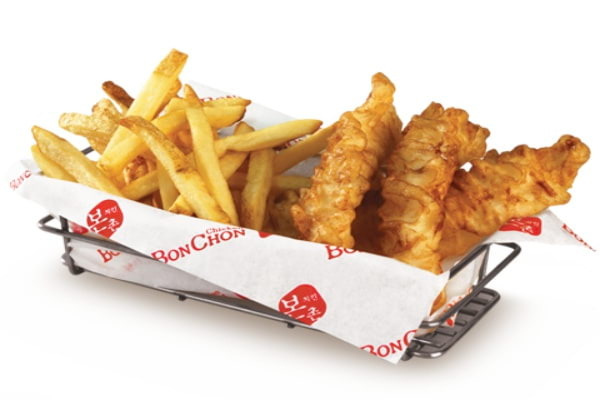 Bonchon is one of the fast food joints that made chicken wings a staple on all our cheat days, but the Korean brand also has a pretty solid roster of seafood meals. If you ever crave for it during the Lenten season, switch up your usual chicken wings order to the Fish and Chips Boxed meal. It comes with a hefty serving of fries and juicy pieces of fish fillets coated with crunchy breading. Add an order of mayonnaise as a dip and settle down for a good meal. 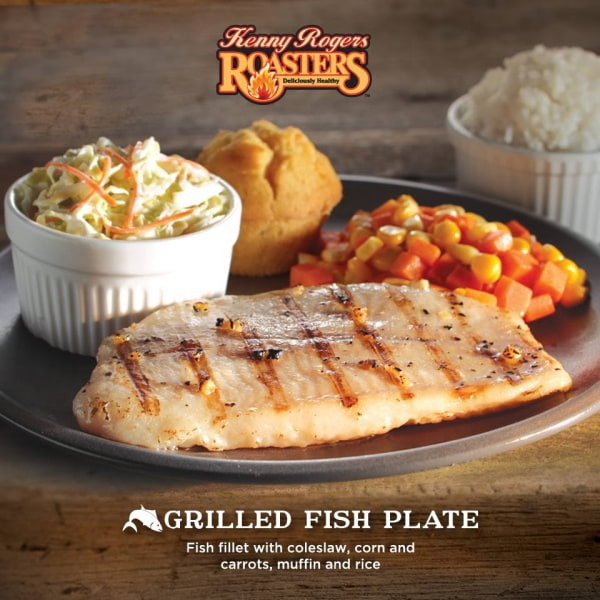 Serving boring and bland fish meals doesn’t exist in Kenny Rogers’ vocabulary. In addition to the Grilled Fish Platter's smoky grilled fillet seasoned with garlic, lemon basil, and other herbs and spices, you also get bang for your buck with the two side dishes (we recommend the steamed veggies and potato sour cream and chives), garlic rice, and muffin that go with the meal. 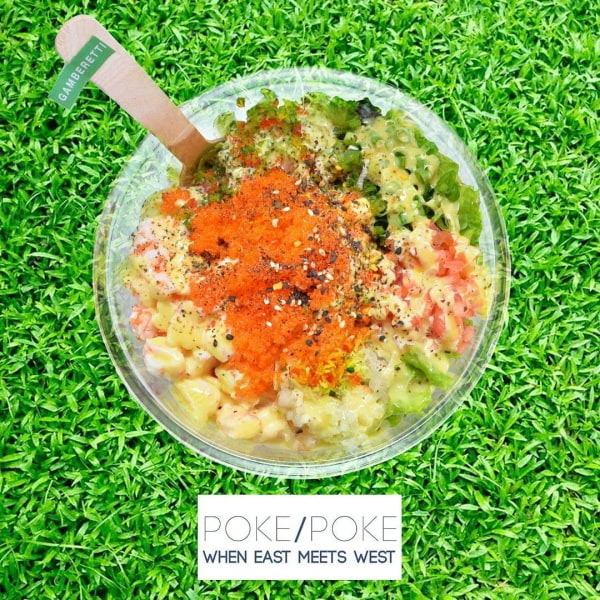 From the makers of Kapitolyo legend Locavore comes Poke/Poke, a Hawaiian and Japanese-inspired restaurant with an East meets West theme. The concept of each bowl of goodness from this dig is simple: Cold cuts, vegetables, and sauce placed on vinegar-soaked rice. The Gamberetti bowl is a filling treat with its toppings of shrimp, mesclun, bell peppers, white onions, and green onions. Complementing the flavors are the cubes of ripe mangoes and hefty servings of honey mustard in the mix. 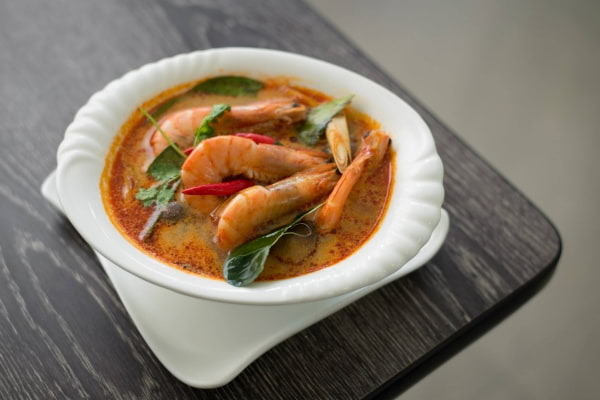 The Lenten season is the perfect time to fill our tummies with more seafood and Smile Elephant’s Tom Yum Goong makes the case for spicy, filling soups that will leave you feeling warm and satisfied. This offering from one of Kapitolyo’s best Thai restaurants is a medley of succulent shrimps and chilies swimming on a spicy, sour, and sweet pool of Tom Yum. Hints of lemongrass and wansoy make the flavor so much more interesting, we won’t be surprised at all if you want to order another bowl. 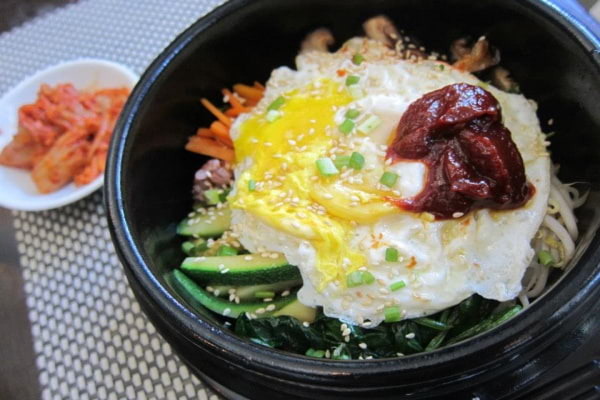 You don’t need to skip your Korean cravings with vegetarian restaurant Corner Tree Café’s take on the infamous bibimbap. The one-pot dish with organic red rice, bean sprouts, zucchini, and shiitake mushrooms is so good, you won’t even notice that it doesn’t have any meat at all! The meal comes with a helping of Corner Tree Café’s homemade kimchi that adds an added kick to the dish. Add some extra raw egg before mixing everything. If you’re a fan of Middle-Eastern flavors, then the menu that Hummus Elijah offers is something you will definitely love, Lenten season or not. 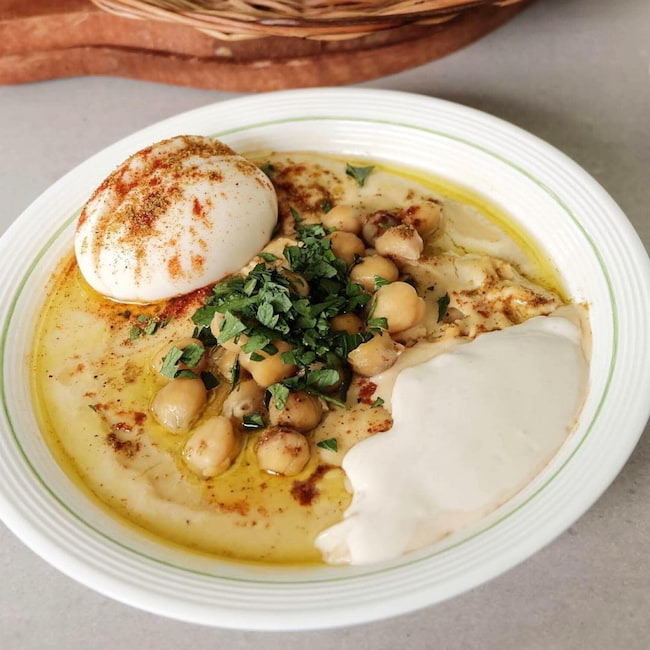 Its serving of hummus will satisfy even the most discerning taste buds with its creamy texture infused with nutty and fruity flavors thanks to the generous helpings of olive oil and tahini. Use this to dip the springy falafels that are worlds away from the dry, rough ones restaurants of the same theme usually serve. They are seasoned so well, you only need to squint to imagine them as meat. 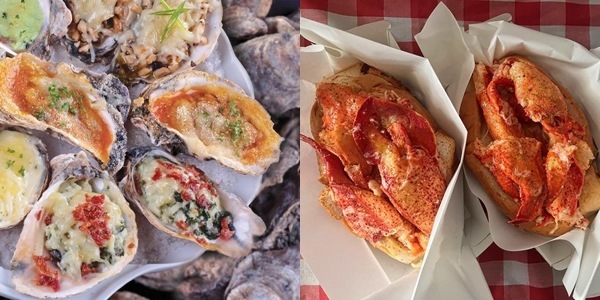 If you’re feeling a little fancy, go ahead and splurge on Bun Appetit’s famous Lobster Roll. Though on the pricier side, you’ll soon realize that it's worth every peso the moment you sink your teeth into it. 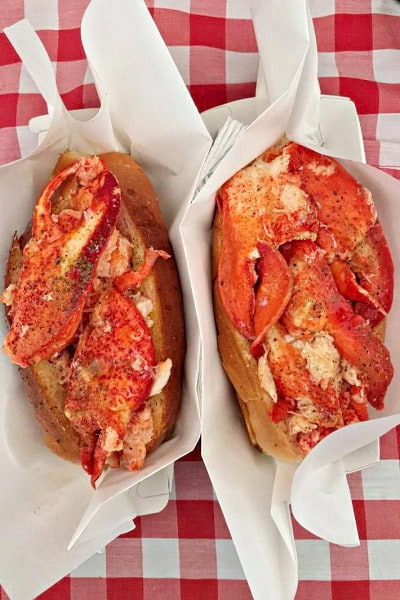 Packed on a buttery and slightly sweet roll is a hundred grams of succulent lobster pieces drizzled with melted butter and a thin helping of mayo for a twist of flavor. 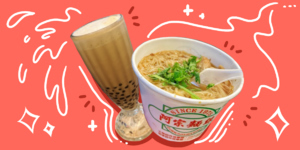 Bun Appetit doesn’t scrimp on their helpings so we're sure that you'll soon line up to its stalls again, Lenten season or not. Calling all classy titas and titas-at-heart out there. 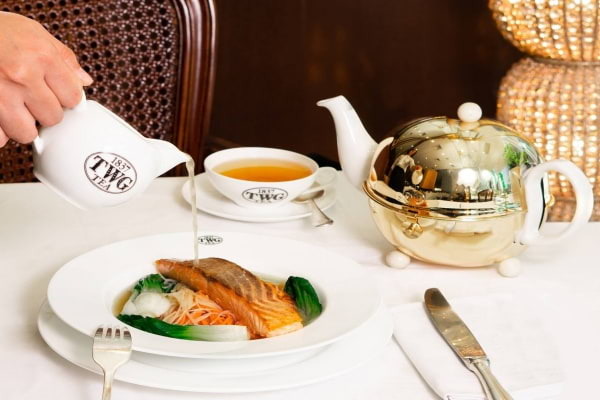 Your fave tea place TWG Tea gives you something special this Lenten season with its ala carte menu of well-crafted seafood. We love their vermicelli topped with pan-fried salmon that is reminiscent of traditional Oriental flavors in Chinese cuisines. The meal also comes with a serving of Oriental Empire Tea that complements the flavors of the main dish. Go all out and feast on the treasure of the sea with Red Lobster’s Seafood Feast. The platter of fresh lobsters, snow crab legs, and shrimp (so fresh you can almost still taste the salt of the sea!) comes with a lemon sauce that chases away the unpleasant briny taste of the fare. The meal also comes with snow peas, wild rice, and heaps of butter for that perfect bite of seafood. 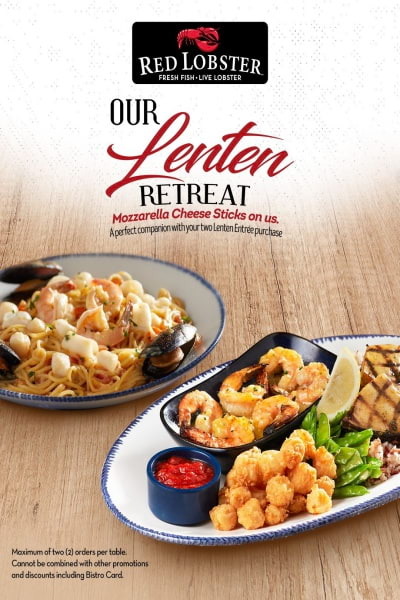 Red Lobster even has a special Lenten season deal where you get free Mozzarella Cheese Sticks if you order two Sea to Table entrees. So this one may not technically be a meal, but the oysters from Filipino restaurant Via Mare are so good and filling you won’t even be craving for rice when you have them! For every plate, you get generously-sized fresh and succulent Capiz oysters seasoned in various ways. 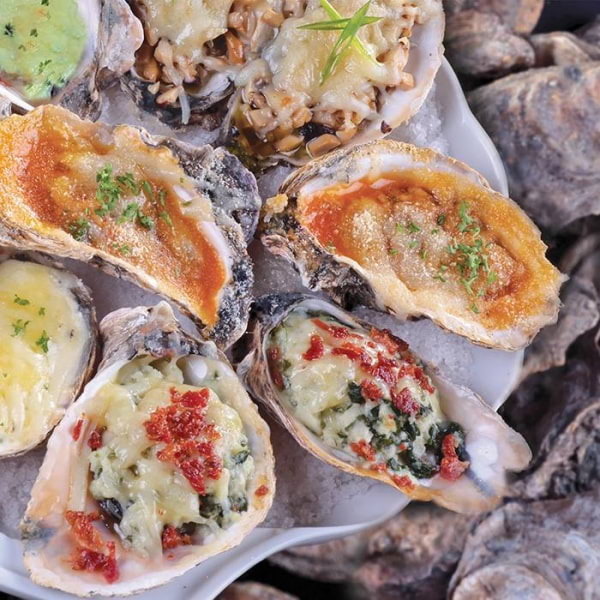 We recommend the Oyster Combination platter so you can get a taste of each flavor like the Spicy Wasabi, Cheesy Parmesan, Rockefeller, Boursin, and Napolitaine. Don’t forget to squeeze some lemon on some to keep your taste buds from getting overwhelmed! Sink your teeth into Boundi & Bourke’s perfectly seasoned pan-seared salmon with buttered sweet corn hash, grilled asparagus, and apple slaw. 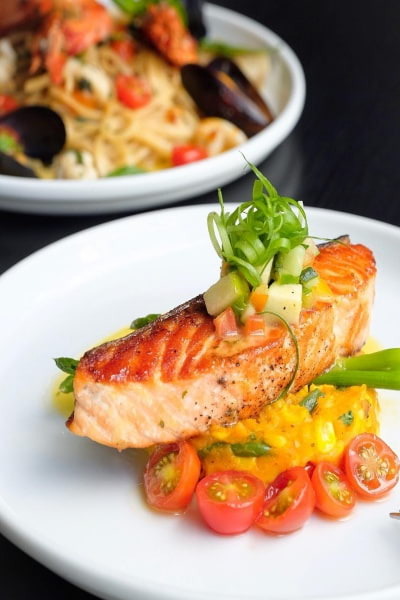 Unlike other pan-seared salmon dishes that tend to be flaky and dry, this meal from the authentic Australian restaurant keeps the juiciness of the fillet and fills in the flavors with its sides. Scrape the sauce off the plate with your spoon, we won’t judge!